Tuzigoot, which is Apache for "crooked water," is the remnant of a Sinaguan village built between 1,125 and 1,400. It crowns the summit of a long ridge that rises 120 feet over the Verde Valley. The original pueblo was two stories high in places and had 77 ground-floor rooms. There were few exterior doors; entry was by way of ladders through openings in the roofs. The village began as a small cluster of rooms that were inhabited by about 50 persons for a hundred years. In the 1,200s the population doubled and doubled again as refugee farmers, fleeing drought in outlying areas, settled here. 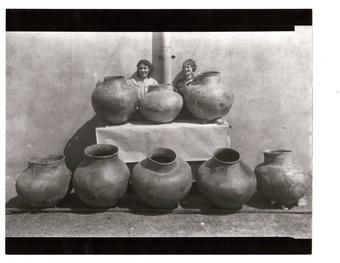 The Sinagua of the Verde Valley were peaceful village dwellers. They lived principally by farming, but supplemented their staple crops by hunting and gathering. Fine artisans, the Sinagua made stone tools of the usual variety: axes, knives, hammers, and manos and metates for grinding corm. Though not adept at the craft of pottery (probably due to the poor soil conditions), the Sinagua turned bone into awls and needles, wove handsome garments of cotton, and fashioned ornaments out of shells, turquoise, and a local red stone for personal decoration. Information came from National Parks Conservation Association. NOTE: The Tuzigoot National Monument is well worth a visit. It is one of few Indian ruins that you can actually walk into and get a feel to how the Sinagua Indians actully lived. Don't overlook this one! 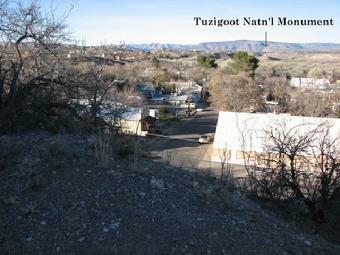 The above Tuzigoot pictures are taken from above the historic Cottonwood Hotel in Old Town Cottonwood, Arizona. CLICK on the pictures to get a larger view. 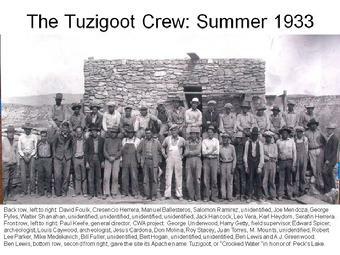 Below are two photos of the crews that worked on the Tuzigoot Project in 1933. Here are the two photos we discussed at the Tuzigoot opening. will take care of it .